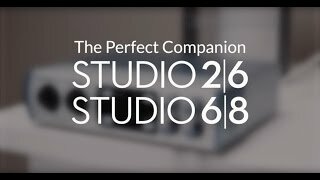 The Studio 68 features two front-panel combo mic and switchable line/instrument inputs and two mic/line inputs with +48V phantom power for condenser mics, In addition to L/R main outputs with front-panel level controls, you get two balanced line outputs for monitor mixing or speaker switching plus stereo S/PDIF digital I/O. All line-level outputs are DC coupled, enabling them to send control voltages. MIDI I/O enables connection to a keyboard, sound module, or control surface, as well, making the Studio 68 a true central hub for your studio.